Here's a small collection of projects I've built for the web. 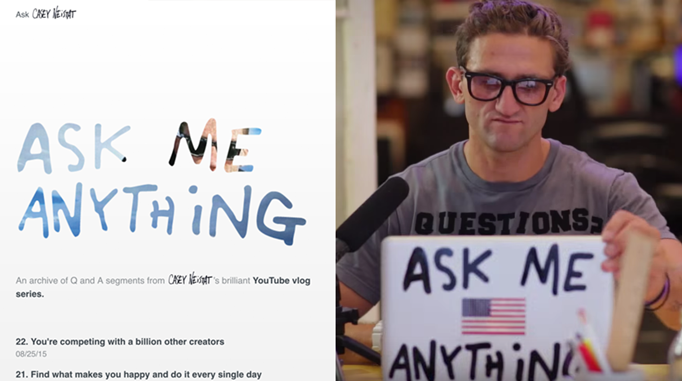 Ask Casey Neistat is an archive of Q and A segments from Casey Neistat’s brilliant YouTube vlog series. I watch Casey’s vlogs daily, and thought that creating a searchable archive of his advice would be a nice way of giving back. I designed and developed the site over a weekend in 2015. The design decisions I made when putting the site together were pretty simple. I had two goals: 1. I wanted to match Casey’s personal style, and 2. I wanted to keep the focus on the content. I made simple typographic choices to address both of these goals. Most of the site is in basic Helvetica/Arial, but I threw in some of Casey’s lettering as accents. I also relied heavily on whitespace to structure the content. 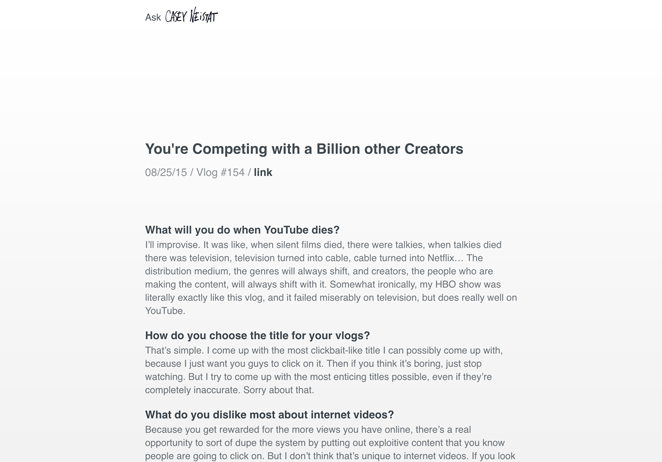 I’d love to extend this website and make a Casey Neistat-bot using Markov chains, since I’ve already transcribed a good amount of his responses to questions. I made simple typographic choices to match Casey's style. 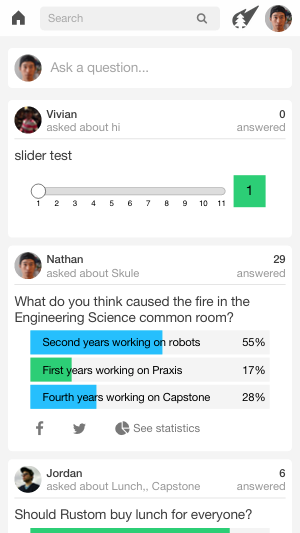 Wildfire is a question and answer-based social network that Jordan, Vivian, Joel and I built for our fourth-year capstone at the University of Toronto. The problem that we identified was that although social networks allowed the public to share their opinion with large networks of people, it was difficult to quantify public opinion on a macro level. Our goal with Wildfire was to create a platform where opinions and ideas could be shared, and users could see not only what people think, but how many people thought the same way. I designed and led implementation of the responsive, React.js-based client-side app. Wildfire has three key features: 1. asking questions, 2. answering questions, and 3. viewing detailed statistics of individual questions. New questions can be found either through a home feed populated by followed users, or by searching the site. 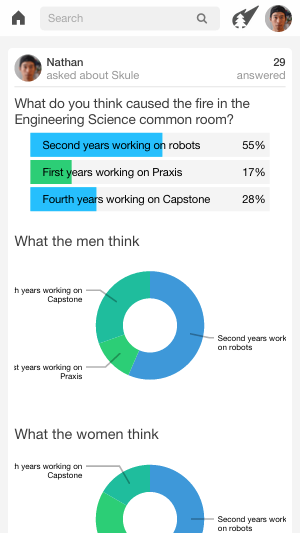 Following the completion of our capstone, we decided to open source the code - check it out! Hey, my name's Nathan, and I make things. If you enjoyed reading about my adventures on the web, check out what I did this past year in VR.